DETROIT -- Sure, diesels are practical. But fun? Volkswagen sets out to prove the two ideas are not mutually exclusive with the Concept BlueSport unveiled here today. 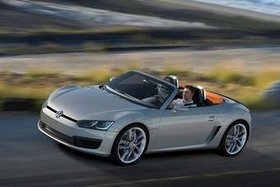 Equipped with VWs signature TDI clean diesel engine, the midengine roadster concept has an average fuel consumption of 42 mpg, or 50 mpg on the highway. In theory, the roadster can go 710 miles between fill-ups while meeting emissions standards in all 50 states. To achieve this, the roadster calls on two technologies that VW says could become more common in the future. Both are part of the so-called Eco mode on the Concept BlueSport: an automatic start-stop system and braking energy regeneration. Neither technology is currently available on any VW model sold in the United States. That goes for VWs two diesel offerings, the Jetta TDI that went on sale in August and the Touareg V6 TDI that hits showrooms early this year. But minimal fuel consumption was just one of two objectives VW had in mind when developing the Concept BlueSport. The other is maximum driving fun. The orange-roofed roadsters 2.0-liter, 4-cylinder turbo engine delivers a maximum torque of about 250 pounds-feet, the same as a 300 PS 6-cylinder engine. A six-speed dual clutch transmission can be shifted either automatically or via shift paddles on the steering wheel. VW says the roadster can reach 60 mph in 6.2 seconds and has a top speed of 140 mph. In terms of design, the roadsters front end marks the first time VWs new design DNA has appeared on a model destined for the U.S. market. Developed by Walter de Silva, design director for Volkswagen Group, the design language conveys the Volkswagen brands core values: unique, simple and universal. The Scirocco sports coupe and new Golf that went on sale in Europe last year carry the new design, as well as the Up! and Space Up! concept cars. The Concept BlueSport previews a production version that VW could launch as an image booster in 2011, but Volkswagen AG Chairman Martin Winterkorn declined to confirm that move. He did say, however, that if VW put the vehicle into production, it would not use a partner.